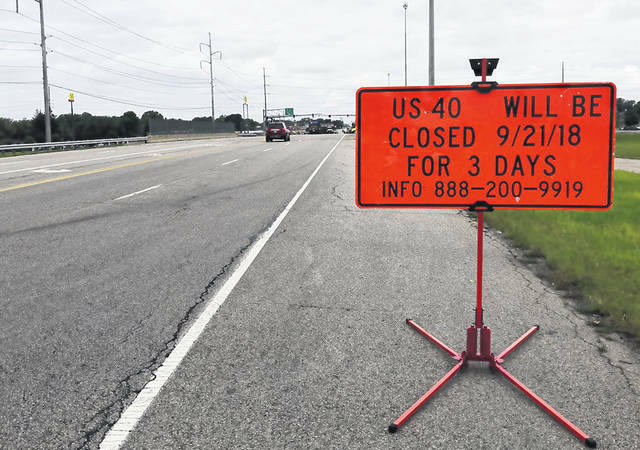 The Ohio Department of Transportation (ODOT) will be closing the overpass to all through traffic for three days beginning Friday, September 21, at 8 p.m. The overpass will reopen Monday, September 24, at 5 a.m.
VANDALIA — The Ohio Department of Transportation (ODOT) will be closing the overpass to all through traffic for three days beginning Friday, September 21, at 8 p.m. The overpass will reopen Monday, September 24, at 5 a.m.
Vandalia’s Director of Public Service Rob Cron says that the closure is weather dependent. “They will make a final decision Friday morning,” said Cron. The closure will allow ODOT crews to resurface the bridge deck. The entire project is slated to be completed in 57 hours. A complete closure was selected over the option of closing certain lanes of travel and having the project linger for several weeks. The official detour will have drivers getting onto I-75 and travelling to the next exit, then getting back on the interstate in the opposite direction to get back to the National Road exit. For drivers travelling east on National, they’ll take SB I-75 and exit on Benchwood Road, then take NB I-75 back to the National Road exit. For drivers going west, they’ll take NB I-75 to the Northwoods Boulevard exit, then get on SB I-75 to the National Road exit. https://www.vandaliadrummernews.com/wp-content/uploads/sites/19/2018/09/web1_US40.jpegThe Ohio Department of Transportation (ODOT) will be closing the overpass to all through traffic for three days beginning Friday, September 21, at 8 p.m. The overpass will reopen Monday, September 24, at 5 a.m.